This is our custom-built 12 Send x 0 Return Mogami Stage Snake (12x0). You won't find a nicer snake anywhere. Construction is Neutrik XLRs with Mogami 2933 cable, fan-out wires with braided sleeve for protection, connectors with shrink tubing for color code and strain relief, and number labels. 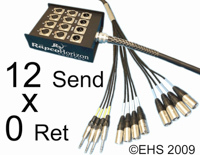 The stage box is a RapcoHorizon box, heavy duty metal box with all Neutrik metal connectors and a metal cable grip. Neutrik connectors are some of the best connectors around, with no screws to fall out after years of abuse. Mogami wire is (as far as we (and many others) are concerned) the best wire, used in the best studios for it's ultimate sound qualities and durability. Mogami 2933 cable is very flexible, durable, heavy-weight cable. ** Note, to keep prices down this is not a typical stocked snake, it will normally require an extra 4-6 days to order parts, build, and ship. Length is the cut wire length, and will be about mid-connector to the end of the box. We can custom almost anything, if you need different options please contact us. Photo 1 shows sample box end (8x4 with M XLR returns) and matching fanout end. Photo 2 shows the wire thickness. Fanout Length: -Normal is about 13"